Jim Swindle has proven himself as a singer/songwriter and radio/television broadcaster. 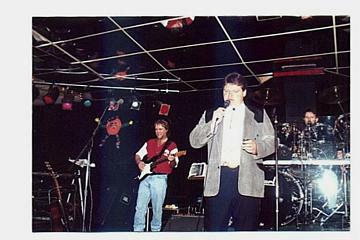 Here is Jim Swindle appearing with "Shenandoah"
Now Jim Swindle is featured in the George Jones Showcase Tribute Show. His many country music websites top the search engines. JIM SWINDLE AND THE GEORGE JONES SHOWCASE TRIBUTE SHOW IS CURRENTLY BOOKING FOR THECOMING SEASON. BOOK EARLY FOR THE BEST DATES. EMAILUS FORMOREINFORMATION. You'll swear George Jones is right there. NEW!!! Check out Jim Swindle's monthly column at the Country Grapevine as he "Sets The Record Strait" on country music facts & fiction! "Jim was an asset in making Shenandoah's Harvest Jam II & III a huge success"
"...it has been my pleasure to work with such a creative and talented professional..."
In this issue of the Country Grapevine I would like to change the pace. Ive passed through many towns, cities, and counties throughout the many great states of our country. I always knew where I was going but could never guess what was in store for me and Barb around the next corner. While passing through central Florida I was blessed to meet and become friends with one of the most likeable people on this planet. His personality is outstanding and talent flows from every pore of his existence. One of those who do not talk about themselves unless asked. He and I discussed all aspects of the music business. After hours of conversation I discovered more about this man. The next time we spoke I was playing the guitar as he approached. He sat in with me and it seemed as if he was having the time of his life. On the road you hear a lot of tall tails. Of course, most of the time there is some truth in each story youre told. Something told me to pay attention to this fellow. I am glad I did. As he began to sing my wife Barb and I closed our eyes. We wouldve sworn George Jones was right there with us. Later on our guest shared many newspaper articles about himself. It turns out he retired from radio, had performed many shows, hosted both June Jam and Shenandoahs Harvest Jams II & III, and worked with many great artists. WLAY AM/FM in Muscle Shoals, Alabama. He is second cousins with songwriting legend Earl Montgomery who wrote 74 top 40 hits for George Jones, including Were Gonna Hold On, and Loving You Could Never Be Better. A tune his grandmother helped him write. It reached #39 on Billboard. By 1993 he released a single of his own, Give Momma A Purple Heart, on an independent label. This Mothers Day classic was quickly picked up by Polygram Records but only peaked at #93 on Billboards country charts. Many things have changed in the last 25 years. He retired at age 28 in 1997. He thought he had done it all. Since meeting this true country gentleman he has gotten back into the swing of things. I havent told you his name, but you will remember him! He is back with many projects in the works. He has developed a new website, started performing again, and is ready to roll. The man I am speaking of is radio legend Jim Swindle. He is better known as The Hossman to many who enjoyed his #1 Arbitron rated Saturday Night request show for years. He is now booking Florida shows with the George Jones Showcase. This live show features Jim Swindle performing George Jones Greatest Hits and is a blast. You wont want to miss this one! He has also developed http://georgejonesmusic.tripod.com as a tribute to George Jones. It is one of the better Jones sites on the web today. Those who know Jim are excited he is sharing his talents again after years of self imposed exile. Bookings for his George Jones Showcase are pouring in. His calendar is filling up. Like the Possum sang, this boy is hotter than a two dollar pistol! Ask anyone who attends his 50 minute presentation and theyll tell you the truth. Jim doesnt impersonate George, he just naturally sounds like him. I spoke with Jim over the phone recently and wanted to learn more about his life and times. He was delightful to speak with and answered my questions without complaint. Gary: Can you share with my readers the highlights of your radio career? Jim: I started at a small station in south Florida at 11 as a d.j. and began playing clubs and events by 13. I was writing songs, performing community service, going to school all at the same time. I had a very busy life. Ive always been big on public service. Being on the radio helped me raise hundreds of thousands of dollars for various charities through the years. That makes me feel good. I remember introducing Mel McDaniel on the Grand Ole Opry. Man what a feeling to be standing on that little round wooden floor cut out from the original Ryman Opryhouse. I helped promote Alicia Elliot before she became a big country star! Ive worked with a whole bunch of great talents. Gary: Who all have you worked with? Jim: Well my memory isnt as good as it used to be. I used to play with the guys from Little Richards band. They also played the inauguration of President Clinton. I worked a little with Jim McBride, the former Sony Music Nashville director who wrote all those great Alan Jackson songs including Chattahoochee. Lets see, there is a bunch. David Johnson, Director of the Alabama Music Hall of Fame and legendary producer. Marty Raybon and Jim Seales from Shenandoah. Oh goodness, there are plenty more but I just cant recall. My grand dad was one of Bill Monroes BlueGrass Boys. Ive been around. Gary: Didnt you tell me you were related to George? Jim: Yeah, he married my second cousin Linda Welborn. The marriage was after Tammy and before Nancy stole his heart away. Linda is sister to Charlene, married to Earl Peanutt Montgomery, who wrote 74 hits for George. His sister is Melba Montgomery who recorded all those great duets with George before Tammy! 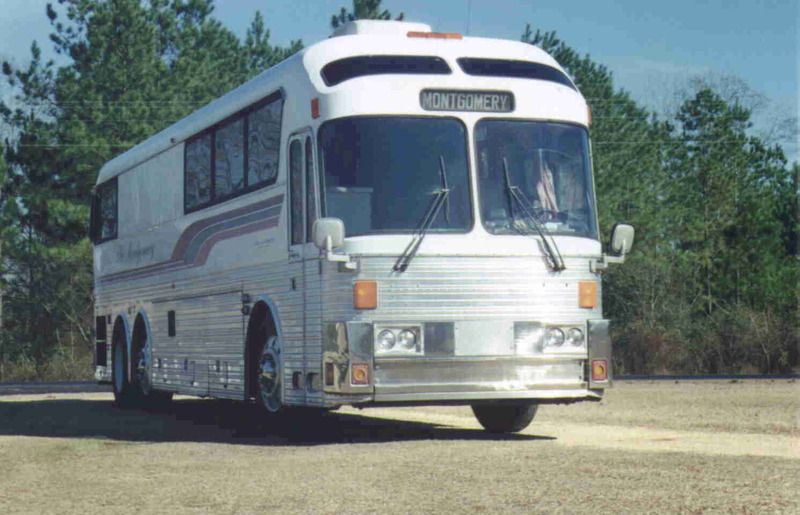 On a side note, Earl and Melbas brother Carl wrote Six Days On the Road. I guess Im pretty much in the mix. Jim: I love to entertain people. I like to see people smile. I really enjoy the excitement when Im on stage. It makes me feel good seeing the audience getting into the performance. Sometimes when Im belting out a real tear jerker I cry along with the folks. Im really glad to be back and looking forward to coming to your town! My e mail is jim@georgejones.us and my GeorgeJonesShowcase information page is at http://www.geocities.com/jimmyrayswindle/georgejonesshowcase.html. Everybody check it out. Id love to come do a show for you. I might just stay all night! Id like to thank Jim Swindle for taking the time to tell us about his adventures. He promised hed call me back with some misadventures as well. See you next month, stay safe, and call your mother and tell her you love her! Until then, Me and Barb are Just Passing Thru. Country Grapevine article used by permission.